Mandatory environmental information disclosure is one of the requirements from the Guiding Opinions on Establishing Green Finance System released in 2016 and was a major talking point at the conference. 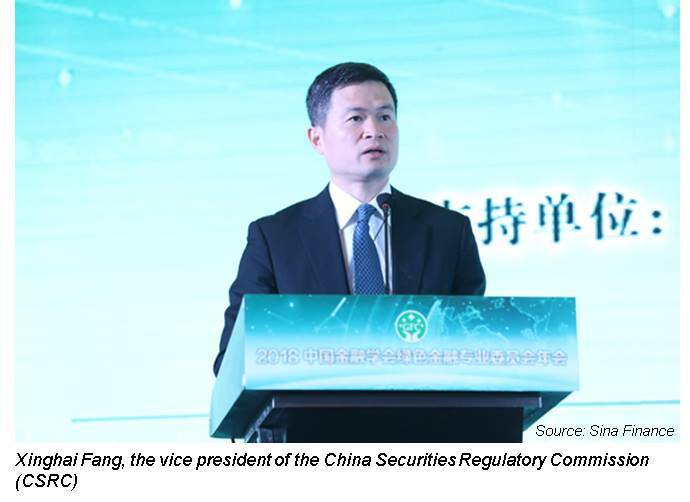 In support of the document, Xinghai Fang, the vice president of the China Securities Regulatory Commission (CSRC), said in the conference that CSRC aims to require mandatory disclosure of environmental information in 2020. To achieve this, CSRC has been conducting amendments for disclosure requirements over the last two years. In 2017, key polluting companies were required to disclose environment-related information. In 2018, other companies are required to either disclose environmental information or explain the lack of disclosure, similar to the “comply or explain” rule of the Hong Kong Stock Exchange. These two amendments have provided the basis for future promotion of mandatory environmental information disclosure for all listed companies. Fang also pointed out that one of the focuses of the CSRC is to lower the financing cost of green enterprises and that mandatory disclosure is a good way to achieve this. With full disclosure of environmental information, well-performing enterprises can be easily identified and be given higher valuations, which will lower the issuance interests of their bonds. To find out more about the status of environmental disclosure by China’s listed companies, check out CWR’s recently released report here. The tightening of disclosure requirements will likely have a positive impact on environmental risk analysis and the quantification of ecological capital, both of which were also hot topics at the conference. As President Xi has said, “green hills and clear waters are gold & silver mountains”. Shijin Liu, the chief consultant of China Council for International Cooperation on Environment and Development (CCICED), stated in the conference that the key issue in understanding this word is to “build a bridge” between the ecological environment and business, i.e., the quantification of ecological costs and benefits. To bridge this gap, CCICED has been researching on the quantification of ecological capital by integrating four basic ecological elements: air, water, greens and soil. So far, an ecological quantification system has been designed to calculate ecological benefits. The next step is to monetise ecological benefits and introduce a practical trading scheme. Read more about embedding natural capital in business from Natural Capital Coalition’s Gough and Harris-Confino here. In fact, China has already made a head start in this aspect by conducting natural resource tax reforms and ecological compensation schemes, as well as the permit trading of water extraction/mining/pollutant discharge etc.. Moreover, the GFC has also initiated a research group for environmental stress testing, which aims to quantify environment risks/benefits for financial institutions. As the ecological environment plays a more and more important role in business, several financial institutions have begun conducting environmental risk analyses for their portfolio/properties. For instance, ICBC has embedded environmental risk into their credit rating models for the aluminium sector. In 2017, the GFC supported and led the research on environmental risk analysis. 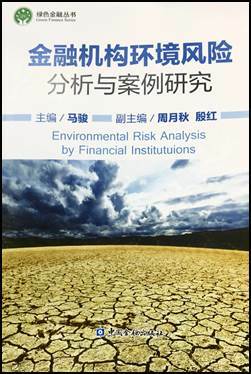 The final achievement of the research was the “first ever book about environmental risk analysis” for financial institutions, “Green Finance Series – Environmental Risk Analysis by Financial Institutions”, which was pre-published in the annual conference of GFC. We are pleased to say China Water Risk was invited to help co-author the water risk chapter of the book. The book introduces environmental risk analysis & management for commercial banks, asset management companies and insurance companies. It also elaborates on a large number of global case studies and corresponding methodologies for environmental risk analysis, including risks brought on by water scarcity, flood, drought, air pollution, global warming and others. One Belt One Road (OBOR) is an important initiative through which China can share its own experiences and contribute to global sustainable development. China itself has followed a “first pollute then control” growth model which should not be reproduced in countries along the OBOR initiative. According to Hong Yin from ICBC, most projects in the OBOR initiative are for infrastructure construction, which can have a strong impact on the ecological environment. Therefore, insisting on green development in countries along the OBOR initiative could prove very meaningful. Financial institutions can play a substantial role based on their broad span in countries along the OBOR initiative and their expertise in green development. ICBC, in particular, appears willing to promote this process. From another perspective, Lingshui Mo from Asian Development Bank (ADB) shared their experience in green investment identification and green cost/benefit quantification. She pointed out that green projects’ reliance on subsidies cannot be sustained in a long term and that a holistic consideration should be introduced to rationally allocate the green cost/benefits in industrial chains. She also introduced two books on green cost/benefit quantification along the OBOR – “Solution to Green Investment Cost and Benefit on One Belt One Road” and “Evaluation Methodology of Green Investment Cost and Benefit on One Belt One Road”. 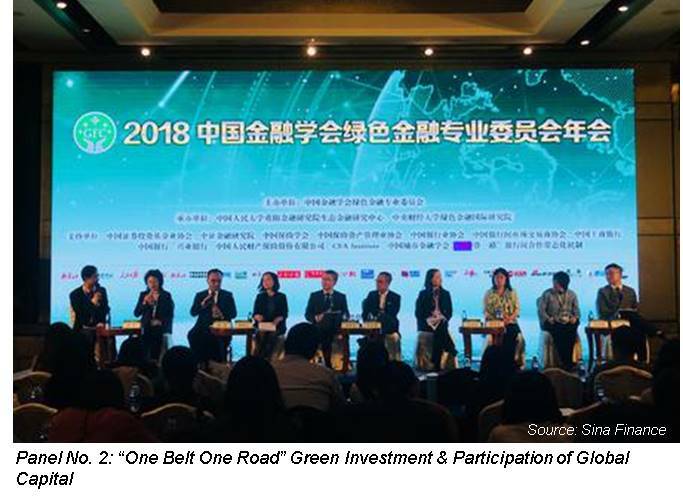 Experts from Ernst & Young, BoC, Silk Road Fund, Deutsche Asset Management also shared their experience and thoughts on green finance and green investment in countries along the OBOR initiative. 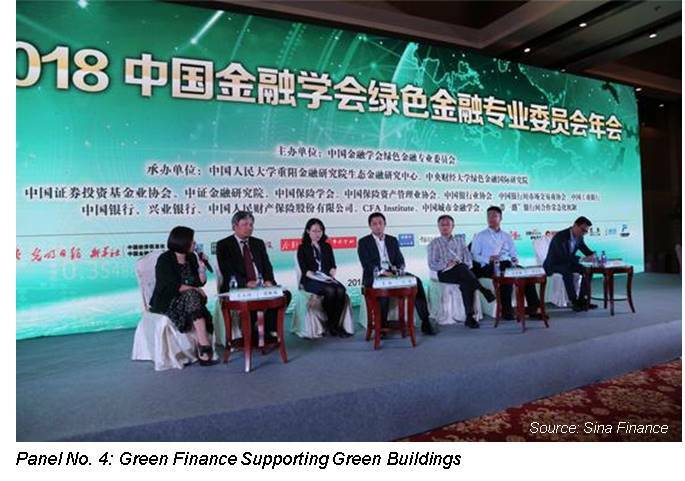 Green finance is also becoming a key component for green buildings in China domestically. According to the China Association of Building Energy Efficiency, in 2015, the energy consumption of buildings in China amounted to 857 million tonnes of coal – about 20% of the total energy consumption of China. As such, the property and construction sectors have great potential to help achieve China’s 2030 energy saving and emission reduction goals. There was much focus at the conference on this topic. For example, Bo Bai from the US-China Green Fund introduced their 2018 focus – data centres. In the US, data centres have become the largest energy consumer, taking up 6-8% of the total energy consumption. China doesn’t use as much energy for data centres, yet it still amounts to 1-2% of the country’s total consumption. Plus, China’s energy efficiency is much lower. The average Power Usage Effectiveness (PUE) for China is 2, while for US it is 1.1-1.2 (the closer to 1, the better). Currently the US-China Green Fund is working with large property companies to conduct energy saving retrofitting for existing buildings. Jingyun Liu from Lianhe Equator Environmental Impact Assessment was also on hand to share his experiences. He found that most enterprises do not even realise that green buildings can be financed with green bonds and that green bond issuance is actually neither complicated nor costly. Green insurance can also be applied as a guarantee both in the process of application and construction. Xiaoliang Fu from The People’s Insurance Company (Group) of China Limited (PICC) illustrated the potential role of insurance companies in green buildings, e.g. property companies can obtain discounts from banks/governments if green buildings are insured, with insurance companies responsible for the quality of the buildings afterwards, etc. China has achieved significant development in green finance since August 2016 when the Guiding Opinions on Establishing Green Finance System was published. In the two years since, China has issued 286 green bonds, amounting to RMB551.1bn. Green credit has amounted to RMB8.2tn by June 2017. Financial institutions are now starting to conduct environmental risk analysis for their portfolios and are designing new instruments for green finance. More green finance innovations are under way in China, and we can already see that capital has begun to flow in a more responsible and sustainable direction. 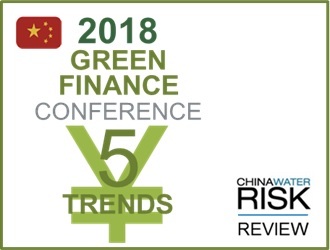 As Syntao have predicted in their “Top 10 CSR Trends For 2018 In China” (see a review here), green finance is here to stay and will remain as the shining star in the field of responsible investment. Closer to home in Hong Kong, the government is aiming to establish a green finance hub and 2018 is already off to a good start – a group of Hong Kong-based financial institutions and “green” companies are planning to establish the Hong Kong Green Finance Association (HKGFA) and China Water Risk is pleased to have been invited to participate as a founding member. Plus, in January 2018, Swire Properties issued a green bond of USD500mn for its green buildings, water efficiency and wastewater. Water and climate risks have clear material impacts in the Greater Bay Area, especially for assets that cannot be moved. The property sector is already starting to look at their exposure and realise the need to quantify these risks plus waterproof their assets. To help build resilience, we hosted a closed-door, high-level discussion for the sector leaders in April – “Waterproofing Water & Climate Risks In The Property Sector”. This is a step in the right direction so contact us if you would like to work with us. Water Risk Valuation – What Investors Say – See what 70+ investors have to say on different valuation approaches we applied to 10 energy stocks listed across 4 exchanges. Is there consensus? What are they most worried about? Where Is The E In ESG Disclosure In China?